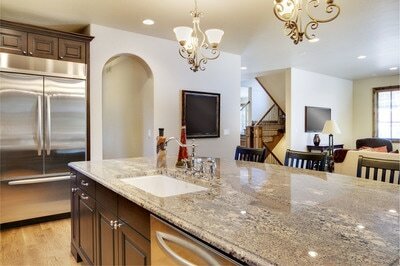 Granite countertop edges can be straight, beveled, or rounded. For a fancier edge, curved edges can be combined with straight edges in a number of variations. The least expensive edge is a straight, square edge, which comes with a very minimal bevel along the upper corner of the square cut edge to prevent chipping. There is a number of edge profiles with a larger bevelthat give a distinctive look. We can fabricate virtually any edge you may have in mind. These countertop edges are very important for the overall look Love your granite countertops and marble countertops, and whether they are in your kitchen or in your bathroom these edges greatly impact the style of each particular look. So as you were going through the process of selecting your countertop, no matter the stone type, make sure you give Time and thought to the type of edge that best fits your taste in your home decor. 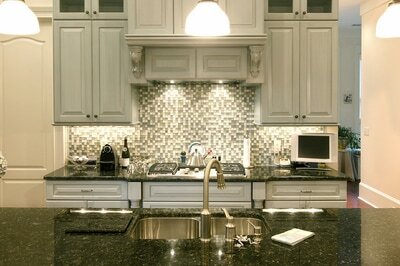 Below is some basic information about countertop edges and few images. Even though the sharp angles of the squared-off straight edge and beveled edges give a traditional look,rounded granite countertops are the most popular. Rounded edges are basically straight edges with the upper (or upper and lower) angles of the edge rounded off. 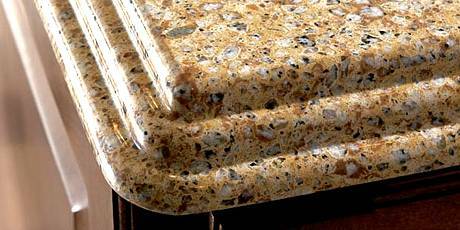 Rounded edges give countertop a warmer, softer feeling and are less likely to chip. The rounded edge is also more comfortable to lean against when at the counter than the sharper edges. A Bullnose edge is a product of the entire thickness of the edge rounded off. In a Full Bullnose, the side view of the edge looks like a semicircle. Deviations of this are the Half-Bullnose, where the top edge is rounded and the curve of the edge ends at the bottom of the countertop’s surface at a 90” angle; and a Demi-Bullnose, where the top half of the thickness is rounded at the edge and then the edge drops straight down for the lower half of the slab’s thickness. Simple straight, beveled or rounded edges are pretty standard for the industry, and the extra cost of the edging is minimal. More elegant designs are available, if preferred, for just few dollars per linear foot. One of the popular choices for edging is abowl-shaped rounded edge, called the Cove. It gives a grooved edge to the countertop. Another elegant choice is the Ogee Edge style combines bowl-shapedand convex curves in its side view, S-shaped profile. The Dupont edge is another popular edge combining a sharp, straight angle with a Bullnose-like curve. Multiple rounded, Bullnose, or Cove edges and combinations of these, greatly add to any design and style. The bottom edge of the countertop can also be shaped. The design can be undercut so that the top edge of the surface is extended farther out than the bottom. ​Numbers of choices of edge designs are available. Though, if the slab were only 2 cm thick, a simpler edge would be suggested. 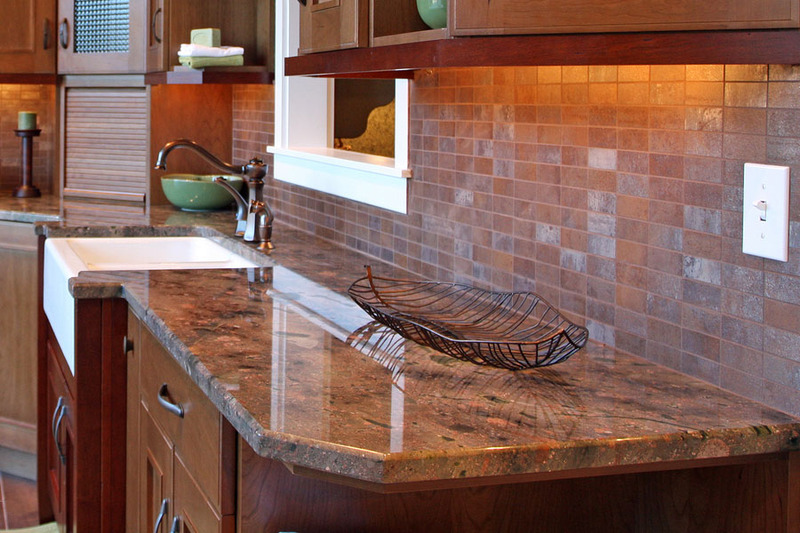 A 3cm slab is necessary for more complex edge design; however,gluing a 2 cm strip of stone to the bottom edge of the countertop before shaping it can create a thicker edge. We always bring many samples to our appointments. Seeing a sample of the countertop edge will give you a better idea of the look and feel of the finished edge than just looking at the profile.